In fact, we are told that Moroni, while on his way to drop off the golden plates he lugged all the way to the Hill Cumorah in New York (named he says, after another hill of the same name located somewhere in Central America), Moroni stopped in Arizona, then went on to Salt Lake; afterwards going to Missouri (Independence & Adam-Ondi-Ahman) and then he journeyed to Nauvoo and Pike County in Illinois, and, before getting to New York, stopped in Kirtland Ohio! 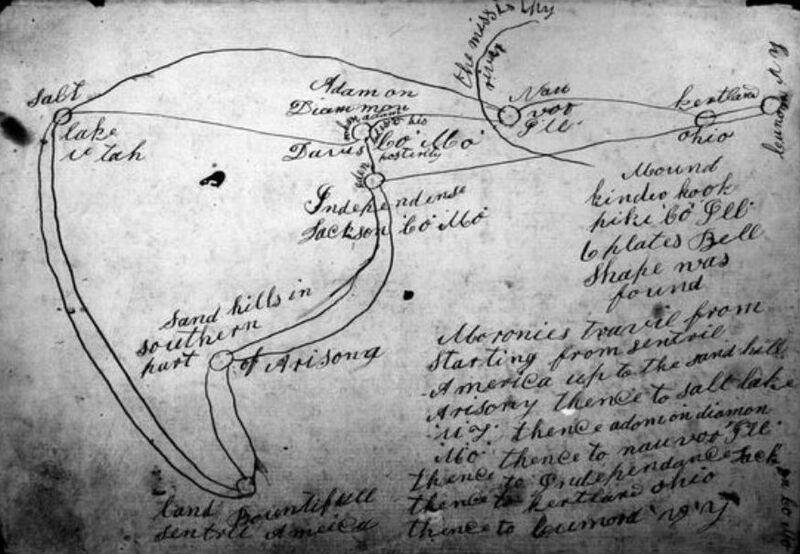 I find it incredible that these same men, who discount statements by Joseph Fielding Smith, Oliver Cowdery and others, that there was only one Hill Cumorah, and it was in New York, would give credence to a statement by Brigham Young about Moroni going to Utah, and this map purported to have been drawn at the direction of Joseph Smith, while discounting the multitude of statements that locate the Hill Cumorah in New York. What I found the most interesting about all of this was the side trip that Moroni took to Pike County Illinois. If anyone is familiar with Mormon History, they will remember that an interesting discovery was found there, known as ‘The Kinderhook Plates’. If this map is genuine, and Moroni went there, why would he go to a place where phony plates were buried in an attempt to fool Joseph Smith? And if this map was drawn at the direction of Smith, does this prove that he was taken in by the Kinderhook hoax? This entry was posted in Book of Mormon and tagged Book of Mormon, Book of Mormon Geography, Limited Geography Theory, Moroni. Bookmark the permalink. Many of those who believed now came and openly confessed their evil deeds. 19 A number who had practiced sorcery brought their scrolls together and burned them publicly. When they calculated the value of the scrolls, the total came to fifty thousand drachmas.d 20 In this way the word of the Lord spread widely and grew in power. I don’t care if it’s called folk magic, white magic, black magic, the occult, it doesn’t matter. Anyone who fools around with it, in any of its forms, is a fool. Some people are so enamored by these “spiritual” manifestations that they buy-into them with out any regard for what “spirit” they are tapping into. The foundation of Mormonism is in the occult. Mormons have rejected God and accepted other gods to replace Him. They are no different than the worshipers of Baal on the high places in the OT. There’s enough Christianity mixed into Mormonism to dupe the followers of Smith. Mormonism is another gospel and its practices come out of spiritualism which Smith was well familiar with. The true gospel, as taught by Paul (as well as Peter, James, John, the other disciplines, and even the Lord Jesus Christ himself) is the same one that is taught by The Church of Jesus Christ of Latter-day Saints. I was hoping you would say this. You pretty much admit a different gospel. Here is the Problem, Paul and the apostles did not teach the gospel you believe, the gospel they taught is not the same as you believe. Now your always harping on people giving exidence, So since you said it, you need to back it up. Where in the Bible is the gospel you believe? Where is the pre-existance? Where is Jesus and lucifer Brothers? Where ios Jesus a sinful man who made it to God hood? Why does God the father say I know of no other gods, and none were before me and none will be after me. Yet you teach we can become Gods and their are millions of Gods? These are just a few things. Show me where Peter taught this stuff? You claimed it was in the Bible now back it up. Kate, correction, I stated that if one was a glass looker and committed fraud he should be convicted of a crime. So what we have is an acquittal, yet there are those of you who still defame Joseph Smith by lying about his conviction for being a glass looker, what were the charges? vagrancy. 1. The date of the trial was July 1, 1830. 2. The charge was being a disorderly person. 3. Twelve witnesses were called. 4. Joseph Smith was held for one day and was fed three meals. 5. Ten subpoenas were issued. The bills contain no testimony or verdict. So tell me Kate, why do Evangelicals lie about the conviction of Glass looker and Fraud, when neither one have been proven? evidence point to an acquittal of all charges. My point is that I have corrected mistakes made here on MC and all I see is everyone running the other direction from this issue and my correction. Changing the subject only makes my point more valid since those who will read this some day obviously will see the obtrusive behavior by some when agenda driven enemies of our Church are inclined too manipulate words, labels and slanderous witnessing. So Kate, a little more for you to digest. Another claim by some is that Joseph was allowed to escape as long as he kept out of town. Anti-Mormon critics such as the Tanners, in their attempts to make Joseph look bad, also claim that Joseph took “leg bail” from the trial, saying that he was allowed to escape with the promise that he would stay out of town. That’s a very odd claim, given that Joseph and Emma were married in that town 10 months later by a justice of the peace. The Tanners can’t explain how this could be. But it’s simple: Joseph was “discharged” as W.D. Purple said (Chenango Union newspaper, May of 1877). He took notes at the trial and appears to be the only eyewitness that wrote anything about it. He said, “It is hardly necessary to say that, as the testimony of Deacon Stowell could not be impeached, the prisoner was discharged, and in a few weeks left the town.” That’s the most reliable first-hand, non-Mormon evidence available. Joseph was discharged, not convicted, and did not take “leg bail,” but simply left freely a few weeks later. Source Jeff Lindsay. Falcon muses: We have a practitioner of folk magic, defending a fellow occultist! Ladies and gentlemen, do we need any further information regarding the spirit by which Helen operates? I guess we are going back into the dark ages, the earth was flat and the Sun revolved around the earth. Divinity Rods, a forked stick, the forks of Satan and those who looked to the dark side, who thought nothing of using any means available to get GOLD, Treasure and OH MY Gosh, Even WATER. Yikes. When God removes his hand from people, they move deeper and deeper into rebellion against him. What we are witnessing here is the demise of a foolish, diluted, and I would say, a spiritually disturbed person. We have reached that point. You seem to be both admitting and denying that Joseph Smith practiced folk magic with a seer stone at the time he claimed to find and translate the Book of Mormon. For clarity – do you accept that Joseph Smith practiced this glass looking or seer stone activity? You seem to have admitted it earlier, but then you seem to want to deny it?? There is a lot written around Joseph Smith’s involvement in folk magic and it is accepted as historical fact even by Mormons, who have a motive to deny it. If you accept that it is true, is it your contention that there is nothing wrong with glass looking or seer stones? Have you purchased a seer stone for your own use? Would active participation in other activities designed to contact the spirit world also be acceptable? – such as runes, Ouija boards, Tarot cards, etc. etc.? I think you are trying to conflate Joseph Smith being convicted in a court of law of fraud with his involvement in folk magic, thereby creating a distraction away from the central argument of Joseph Smith being involved in a type of sorcery forbidden by the Scriptures. One could even argue that his involvement in this activity opened him up to deceiving spirits – perhaps there is a spiritual power to the Book of Mormon, but it is not from God. seems you have a lot to say about JS, AND your the one that asks for evidence, and your the one that said Paul taught mormonism, so are you going to back up your statement, or will you be a Genisis 1:1 type of person? You have no form or substance. I think I said many posts ago that I don’t care if Joseph Smith was convicted or not. You are so hung up on that. It doesn’t matter! What matters is the FACT that he did these things. Doesn’t it bother you at all that your founding prophet used a MAGIC ROCK ( Well a plain old rock he claimed was magic) to translate the BoM? The KEYSTONE of your religion? Isn’t that really bizarre? Of course we are taught that it was the urim and thummin by which he translated. The rock was lied about. Your comments about Benjamin Franklin and lightning are so OUT THERE! What did the references to Job have to do with what we are discussing? I love your comment about the Tanners. Those darn people just make all of this stuff up just to make Joseph Smith look bad. I hate to be the one to give you the news Helen, but Joseph Smith does that all by himself. He was/is bad. As far as your divination practices, I showed what God’s Word says about that. Laugh it off, falcon is right about you. 4fivesolas states: I think you are trying to conflate Joseph Smith being convicted in a court of law of fraud with his involvement in folk magic, thereby creating a distraction away from the central argument of Joseph Smith being involved in a type of sorcery forbidden by the Scriptures. falcon frantically labels : What we are witnessing here is the demise of a foolish, diluted, and I would say, a spiritually disturbed person. When you run out of ammunition, take the next best thing you do (ad hominem) and just stand there and yell insults at your dueling one-on-one challenger, hoping the duel will be called off for lack of your bringing bullets. LOL. Why should any of us believe the quotes that you have posted. What makes your evidence more reliable than Andy’s? I’m sure you have heard that Casey Anthony was found not guilty! Even though everyone including the Jury knows she is. Does that mean that she absolutely DID NOT KILL HER BABY??? No, it just means she escaped through a loop hole! I for one believe that Joseph Smith was convicted of fraud and glass looking, you on the other hand are trying to make him innocent through a loop hole. Glass looking, treasure seeking, magic rocks, jupiter talismans, pagan symbols, divination, folk magic, black magic, voodoo etc. are all considered cultural ideas to some. Not all of us believe that these things are from God. You do and that is something that you will have to answer for. God’s Word tells us about these things and that is what we as Christians look to for guidance. Maybe you should put away all of these things and come unto the true and living Christ of the Bible. are all considered cultural ideas to some. Cannibalism is a cultural idea to some, does that make it ok in Gods eyes? I can see it now, God says, Thou shalt not murder, but some guy says, But Lord we have no food, no rain to grow crops, all the land is barren, we prayed for food and you sent a group of people over to us. So we felt you answered our prayers. You sent some black people for those of us who like dark meat, sent some fat people for those of us who like fatty meats, and some really fit people for those of us who like lean meat. Yea, that great. I somehow just dont buy that. This has actually been my take on the whole first vision account for a long time. Either JS was right, a total liar, or he was overtaken by the enemy. Opening yourself up to the occult is serious business, whether it’s considered “cultural” or not. I’ll read snippets of the BoM, but I refuse to delve into it for the sole purpose of protecting myself. Some people are strong enough to dive in and not be phased. One of my friends (Christian) read it for research. She was awoken in the middle of the night with a dark heaviness and immediately began praying. She ran and got the book, threw it out, and was instantly better. So it wouldn’t surprise me in the least if JS was under some kind of spiritual influence when all this happened. That just kinda creeped me out a little! I had never really thought about Joseph Smith being under some kind of spiritual influence. I had just come to the conclusion that he was a liar, deceiver and a fraud. The past few days of dialogue with Helen have really got me thinking that all of this is truly based in the occult and evil. I have learned of JS occult practices, but never really put it together how evil it was/is. The really sad part is that everyone around me is in up to there eyeballs with this stuff. How on earth does one go about helping them see God’s truth? I think it has hit me just how serious this is. Have Rick email you his information. It’s helpful. Actually here are the facts about Smith’s “leg-bail”, which the Tanner’s certainly did not ‘invent’. While Joseph Smith was working for Josiah Stowell, he was brought before a court on charges sworn against him by a nephew of Josiah Stowell, Peter G. Bridgman (or Bridgeman). Apparently Bridgman became concerned that his uncle’s money was being spent in the pursuit of elusive treasure. Accounts of these charges corroborate Smith’s treasure hunting in southern New York and Pennsylvania. I’ll read snippets of the BoM, but I refuse to delve into it for the sole purpose of protecting myself … One of my friends (Christian) read it for research. She was awoken in the middle of the night with a dark heaviness and immediately began praying. She ran and got the book, threw it out, and was instantly better. So it wouldn’t surprise me in the least if JS was under some kind of spiritual influence when all this happened. In later conversations with my husband (a lifelong Christian) he said that whenever he’s felt the Holy Spirit, it was more like his senses were heightened and he could recall every word with crystal clarity. I have found -now that I have been saved by the true and living Christ- that this is true. I know that what I felt then was not from God. Since coming to Christ 6 years ago I have entered an LDS church building only 3 times. The first time, I was vaguely uncomfortable which I thought was just due to finally knowing all the crap about JS and his deceptions. The 2nd time, I was even more uncomfortable. Then because of the deep, personal relationship I now have with my Savior and His Spirit which is in me, the last time I passed through those doors I immediately felt a change and knew that there was a presence throughout that was opposed to God. You can believe what you want, but I am not making this up.